Not the latest from Milan… Not visions of the catwalks of New York… But a DUNNY! Is Australian Country magazine the first Australian publication to put a Dunny on the cover? What is it about Australians and Dunnies anyway? 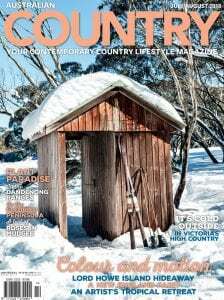 The glossy Australian Country magazine July/August edition has proudly published with a snow-clad dunny on the front cover. Cold, yes, and possibly very drafty, but definitely one of the more scenic toileting arrangements in Australia. Australian Country Magazine proudly distinguishes itself by covering the parts of Australia the other magazines overlook and presenting the real stories from the bush, rather than the overly glamorised airbrushed version. It’s the kind of strategy that has won Australian Country a steady 163,000 readers (EMMA Jan 2018), making it one of the top 10 publications in its category this year. Aspiring dunny spotters can find this one between Mt Hotham and Dinner Plain in the Victorian High Country. “The Dunny has had such a good response in early scan sales, we might even make it an annual feature. Perhaps there’s a competition in this to find the Country Dunny of 2019,” says publisher Janice Williams. The company behind the Australian Country cover dunny, Universal Media Co has been using the dunny as a device for years, with one of the more popular calendars in its stationery range being the Aussie Dunny Calendar. The edition featuring the dunny published on Thursday 5th July and is in all newsagents and supermarkets and is selling very well. Australian Country Magazine has been championing the real Australian Country to fans in both regional and metropolitan locations for over 21 years. The publication is growing, having spawned a sister title called Australian Country Homes in August 2017. “The country aesthetic continues to find fans,” publisher Janice Williams says. “The inaugural edition of Australian Country Homes reached its projected audience early in its life and as a result is now a welcome regular edition within our stable.” Australian Country also communicates to its fans via the web portal AustralianCountry.net.au, a regular eNewsletter, plus a Face Book and Instagram community. Australian Country is published by Universal Media Co. Universal Media Co. is Australia’s largest niche publisher, and specializes in helping marketers find targeted audiences via print and online media. Universal’s 53 magazine brands include leaders in home, craft, bike, and some lifestyle categories, plus 12 niche web portals. The company owns the Australian Publishing Company and Universal Online Media. Universal Media Co. is an independently owned private company.